Should you be alone, or with your family, or a small group of friends or with spiritual practitioners, do not hesitate to contact us, we will develop a custom-made escorted tour upon your personal approach, agenda and request. All our options will allow you to create your own itinerary, with the help of our local specialists, guides, lecturers and academics. Please take a few minutes to browse the various itineraries of our Scheduled Escorted Tours and get an idea of the main options we have on offer. We will then assist you in putting together an itinerary that will serve your exact interest, requirements and approach. Please do not hesitate to contact us for further information concerning Triptyc Two: "Parzifal" (Perceval) Grail Quest and/or our Tours & Studies! The option to Keltic Trilogy / Triptyc Two: 14 Days remains always flexible and responding to the participant's main interests and therefore can always be re-united or added to another extra option: Triptyc Two: "Parzifal" (Perceval) Grail Quest. Introduction to "Triptyc Two: "Parzifal" (Perceval) Grail Quest"
Welcome to "Caer-sidi" (II) ! As Caer-Sidi Triptyc Two: the " Parzifal " (Perceval) Module approaches the Grail Quest when it is perceived in its Tantric or Gnostic esoteric essence. As such, this itinerary is simply the continuation of Caer-Sidi Triptyc One, in the sense that it seeks more indepth the traces of the Grail Quest ancient archetypal keys, as they may be found within the energy of selected historical sites, as well as in such traces as the works of Wolfram von Eschenbach on Parzifal (Perceval) and "la Terre Gaste"", as well as in the hymns, paintings, ruins, scriptures and other artifacts of the Troubadours Lore testimonies. As in the first Tryptic, the Grail Quest will start from the meditation in and around the chapels of St. Thyrs, Ste Anne and other nearby altars, seeking for an intimate understanding of what means the reference to Parzifal (Perceval), or in other words of the practices on the Path of the Embodiment of the Heart Chakra and the Dakini (ie: Creuses le Coeur), which in Grail Lore is the Chivalry Lore to the Lady. For this, there are in situ numerous symbolic traces which may be pursued at a deep resonance level, such as the legends of the Garden of the Roses, of Aballach (Apolon), of the Apple Tree, of Mary Magdalene symbolic Grapes, of the White Lady of the Lake and its Fairies. All these traces are layers of the overlapping presence of the Heart Chakra Grail Lore. For such a process, we will be approaching our perception of the common roots Keltic and Central Asian Mongolian Shamanic practices, as they may have been performed from the early Keltic Christendom period. We will refer to the Celts, Galilean, Arianists, Nestorians, Bogomiles, Scythes, Wizigoths, Khasars successive migrations, leading to the later Templars-Mongols magical-military alliance concluded between Ghazan Khan and Jacques de Mollay, the last Master of the Templars in Jerusalem (1299). This program is under EU- intellectual property rights and academic copyrights (c) William R LEON (PhD) CAIRN Consortium (EU-NGO). Concept of "Triptyc Two: "Parzifal" (Perceval) Grail Quest"
Myths, as they have settled in history and popular tales are the purveyors of a wisdom that was born with the race of Man. Triptyc Two: " Parzifal " (Perceval) will directly lead us to the Grail Quest Tantric path to the Knights or the Troubadours Lore, in other words to the Heart Chakra. When studying the middle-ages Roman Courtois, Chanson de Gestes and/or Ministrels Lore to the Lady, one can discover therein the symbols and rituals of Alchemistry. Also, one can found originally in the Shamanic Totems in the Knights Heraldic status and activities in Legend. Such symbols came with the successive migrations of the Scyhtes and Wisigoths, whom had Orders of Chivalry, within their castes systems. These were embedded in the dualistic philosophy found in the Arianists, Nestorians, Bogomiles and Khasars (Galilean) faiths, and also can be linked to the Mongols. All in all, such Central Asian Shamans practices are more present, than absent, in Wolfram Von Eschenbach's "Parzifal" works (Templar Troubadour XII AD). This programme starts with a retreat of a minimum 5 days in the center of the target site, allowing the further study of the so-called Nine Templars Chapels and their surrounding Cairns, Dolmens, caves or references to sacred sites. To approach step by step the Grail Quest, there are several paths, keys, initiations and self-arising manifestations, which very much depend upon the particular site visited, than on the visitors own biography. Testimony itself shows the birth of the Arthurian Grail Quest and Celtic legends of Saints and Warriors coming from the historical recollections of the successive migrations from Central Asia of the Arianists, Scythes, Wisigoths, Huns, Germans, Franks shamanic faith tribes, which led to the end of the Roman Empire (West) and consolidation of the (Long Hair Sorcerers) Merovingien kings in the previous Septimania , then named the Razes around Rennes le Chateau and Limoux (Aude) . Originating from the Black See (Central Europe) and Asian steppes, the Shaman practices of early Christendom was blended in an intricate mythological background, where Runes, Animal Spirits , War Protectors , Fairies, Angels or Saints were part of a practical Gnostic Gospel . The early Christendom literature shows that these were beliefs being alive in the practices of Cathares and Knights Templars . We could consider the references in the Rig Veda of human interactions (or relations) with the Gandhavaras (Spirits of the Air and of the Waters) and Apsaras (water nymphs) , in charge of the magic Soma and who were skilled in medicine and music. These entities bear resemblance with the roles played by Celtic Fairies (spirits) or the Grail Lore Ladies of the Lake (Waters, or del Acqs), who as Vivianne del Acqs and Morgane Le Fay , are the Guardians of the Isle of Avallon (Avallach), the invisible Gates to Caer Siddi (Annwn) and to the Grail's vase divination and healing powers. The long-haired Merovingians kings had ruled the same region of early "France" from 500 AD to 752 AD. Their dynasty suggested links with the lost Tribe of Benjamin, as traced via the Gaul-Celtic migrations from Syria to Acadia, thence to the Pyrenees, after going through the Rhine region. In 1200 AD, the Cathars "Parfaits" (Bonhommes) had been perceived by the powers in Rome as a direct threat. They lived , as Saddhus and GnaKpas, in poverty and chastity, and had only one sacrament, the Consolament(um). This was an initiatic rite (Bapteme of Light), provided only to adults, whether as the ordination prior to becoming a Parfait (Bonhommes), or before going to battle (Feudis) or while in the process of dying. 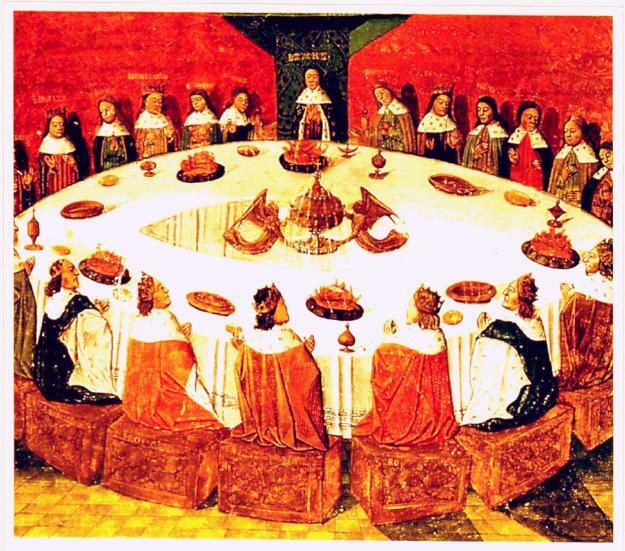 The Holy Grail reflected the spiritual Quest of both the Cathares and the Celtic people. The Arthurian Quest led to a Mystical Communion. As Arthur, the Holy Grail belong to the Land : " He IS the Land ... "